Ultra Klean Ultra Wash™ mouthwash effectively cleanses toxins from your mouth. Easy to use. Just swish and spit. If you are subject to oral saliva drug testing with a swab, make sure you are prepared. This mouthwash is highly effective. Place in mouth and swish for 2-3 minutes. 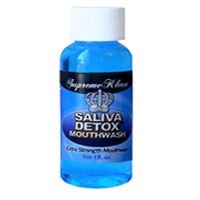 Your mouth will now be coated with solution and saliva will be clean of toxins for approximately 30-40 minutes. Works every time! These capsules help boost the effectiveness of the mouthwash by helping loosen and flush oil soluble substances from fatty tissues in the body. Use these saliva pre-cleanse capsules if you have high toxin levels and/or you are overweight. These capsules are to be taken on the day prior to your saliva drug test and are extremely effective against high toxin levels when it comes to drug testing.